Recently I talked about the Magnum Square Print Sale, where for a specific time you could purchase signed or estate-stamped prints for $100 from over 60 Magnum photographers. I bought two and have them on the wall at the studio. I love them! Here's another opportunity worth considering. 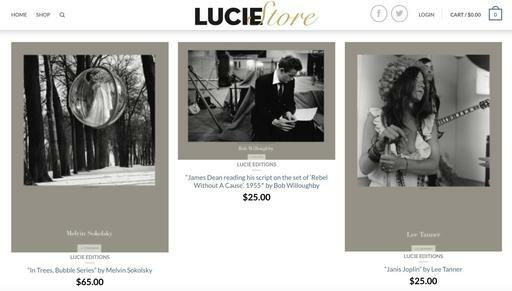 The LUCIE Foundation is offering LUCIE Editions, limited edition posters made by master photographers recognized at The Lucie Awards. These Lucie Honorees represent some of the most important photographers of the 21st century. I just purchased Kareem and Wilt by master sports photographer John Biever, the 2012 Lucie Honoree for the Achievement in Sports Photography Award. There are 450 unsigned limited edition posters, size 18" x 24", and 50 signed limited edition posters, also the same dimensions. The unsigned poster is available for $25, and signed is $50. Shipping was $9.50. I love being surrounded by great photography in my workplace. I find images like this inspiring. These posters are beautiful and affordable. You might want to take a look.